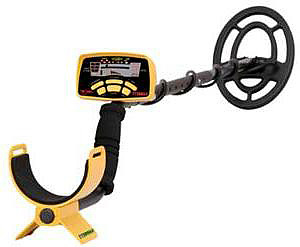 The Garrett ACE 250 is not just a new detector, it's a new way of thinking. Garrett has taken much of the leading edge technology and well thought-out features from their GTI and GTAx lines and packaged them into an aggressive, rugged outdoor, attention-stealing new design. Good looks aside, amazing technology has been packed into this new machine. From custom notch discrimination, pinpointing, adjustable sensitivity and depth settings to the newest addition of the PROformance coils series, the 6.5x9" ACE coil, this detectos will never stop impressing you-- or finding treasure! Highly Recommended for Coin Hunting, Competition Events, Dry Beach/Fresh Water Hunting. Recommended for Jewelry Hunting, Relic Hunting, Ghost Town Hunting. Instructional DVD ships with each detector. Pinpointing with the ACE 250 Pinpointing is one of the most important, but simple to learn, techniques you need when treasure hunting. Knowing how to pinpoint correctly can mean the difference between digging a six-inch hole or a 2-inch plug. The ACE 250 is equipped with an electronic Pinpoint pushbutton that makes pinpointing more accurate. Using this Pinpoint Mode is simple to do. After detecting a target, place the searchcoil on the ground to the side of the target's suspected location. Now, press and hold the Pinpoint pushbutton while maintaining contact with the ground and slowly move your searchcoil from left to right and then front to back over the suspected target’s location. The maximum sound will be heard when the target is directly beneath the center of the searchcoil as shown. Also, while electronically pinpointing, the Upper Scale on the LCD indicates signal strength. When the greatest number of LCD segments (increasing left to right on the scale) is shown, the center of the searchcoil is directly over the target. NOTE: Keeping the searchcoil on the ground will help ensure the distance between the coil and the ground remains constant throughout the pinpointing process; in this case the distance is zero inches. If the terrain does not allow for this type of "coil scrubbing" then do your best to maintain a constant height between the coil and the ground. The pinpoint location is almost always in the center of the coil. In other words, a target pinpointed with an Ace 250 will be directly beneath the center of the searchcoil (See Using the Pinpoint Mode). However, exceptions to this rule may occur for oddly shaped iron targets, such as a nail or piece of wire lying horizontally in the ground; flat objects on edge; or, even a very shallow coin. In cases such as these, the pinpoint location may be closer to the front of the inner coil. By carefully paying attention to the audio signals (and the Upper Scale indication on the 250) you'll quickly become familiar with how your Ace pinpoints deep and shallow targets.